With New Year’s Eve falling on a Thursday this year, I imagine there are going to be lots of parties happening out there, as I’m sure many people will take a three day weekend. One of the biggest party problems out there? Making sure your guests and their glasses stay in touch. 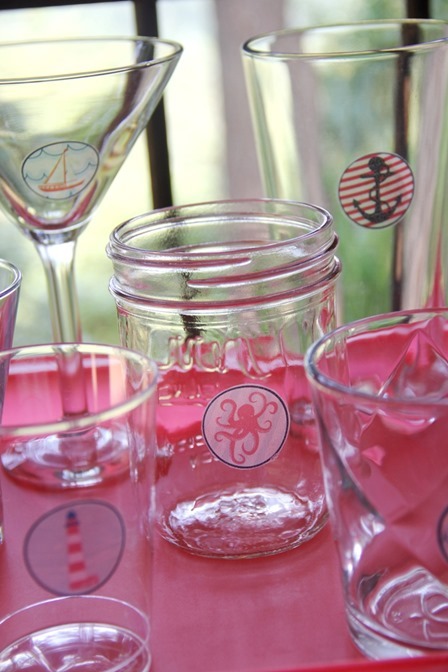 There are cute rings to go on your wine glass, and there’s always the tried-and-true Sharpie for the disposables, but what about all the other glasses? I’ve got the solution! Cut Out and Keep provided me with Silhouette Tattoo Paper (affiliate link) for this project, and you can see the complete instructions there. I purchased the art from DigitalCollageClub on Etsy. The idea here is that you make two sets of temporary tattoos. One goes on the glass and the other is applied to your guest. As the night wears on, all they need to do is match their hand to their glass. Depending on what type of beverages you happen to be serving, it could turn into quite the interesting game! I tried this on all kinds of glassware, including Mason jars, all with success. I even got brave enough to slap one on my Fiestaware, and it came off without a hitch. I’d recommend leaving a small bowl of water and some paper towels or a sponge near the glasses for easy application. Removal was easy, and I covered how I did that in the instructions. Have a safe and fun party, and don’t worry about keeping your glasses and guests together and happy!